One Student at a Time Over 40 years of experience has taught us that children love to learn! Our program engages children and encourages them to explore new concepts, using teaching methods designed for young children. Our goal is a happy, well-adjusted child. At Every Age, Every Stage	The most rapid period of brain development occurs between birth and six years of age. These are critical years for your child. At Landmark Preschool, we nurture the whole child, beginning with helping children learn important social skills, supporting emerging language, developing confidence and curiosity. 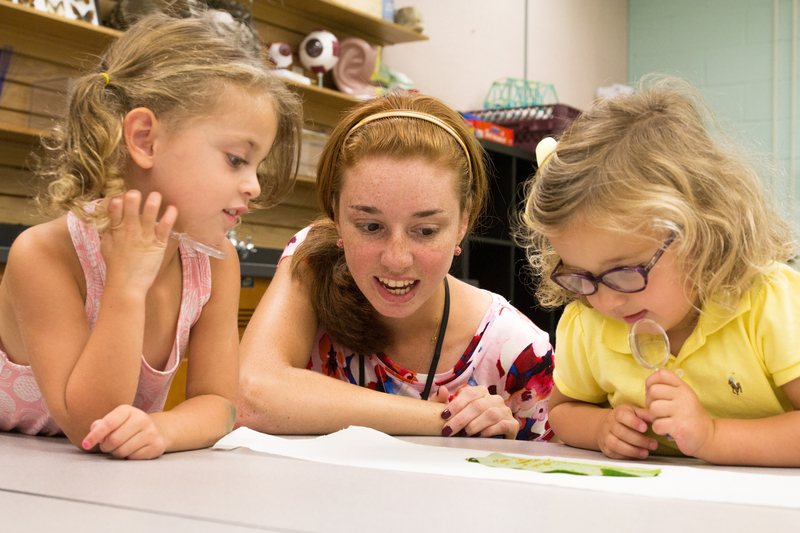 Our programs and classrooms are tailored for children's developmental needs. They are each carefully designed with your child's needs in mind. More than Phonics Our literacy program introduces children to more than just the alphabet. Children love literature, starting with stories and flannel boards in our Ones and Twos, and continuing throughout our program. Children learn through play, so we teach games and hands-on activities. We work closely with students, adjusting the level of instruction as needed. Students progress at a rate that allows them to be happy, confident learners. It All Adds Up to Success Early math concepts like spatial awareness, positional concepts, colors, shapes, patterns, sequence, and graphs are so important for success with later math skills. Under the expert guidance of our teachers, children develop these skills. As children progress through our program, we also introduce numerals, and the concept of one-to-one correspondence. We use games, calendar math, and technology to broaden students' understanding of the uses of numbers. A Leader in Educating Young Minds Science, technology and engineering are wonderful ways to tap into a preschool child’s natural curiosity about the world. We integrate lessons on these topics with our themes to support cross-curricular learning connections. Children learn why fat helps keep a bear warm when it is cold. They learn what makes a ball roll down a ramp faster or slower, they engage in collaboration and problem solving as they work together on building the best house for the three little pigs. We use interactive whiteboards to bring the world into our classrooms with virtual field trips, and exciting learning games. We introduce coding using child-friendly robots and games. Technology is all around us, we want our students to understand what makes it work. It's Terrific To Be Two! It's Thrilling To Be Three! It's Fabulous To Be Four! It's Fantastic To Be Five! We Put The "Fun" in Fundamentals! Children study a world language and culture through songs, stories, games and activities which relate to the themes they are working on in class. Common vocabulary such as days of the week, colors, numbers and frequently used phrases are also incorporated into the curriculum. Teamwork and sportsmanship are key concepts for our preschoolers. We cheer for our friends while learning new games, building our stamina, and gaining hand-eye coordination with a wide variety of developmentally appropriate games and activities. Develops large motor skills and coordination through locomotor exercises (walking, running, hopping) and activities that focus on eye-hand and eye-foot coordination using parachutes, hula-hoops, bean bags, etc. Using both new and familiar songs, children sing, dance, and play instruments as they are introduced to musical terminology, and learn about concepts such as keeping time. Since part of the joy of acquiring these skills is sharing them with others, there is an age-appropriate performing arts component to our music program as well. Introduction of computer parts, using a mouse and keyboard for various games, graphics, and specific activities. Utilization of interactive whiteboards in our classrooms to explore various subject areas and skill sets. For young children, the process of making art is actually more important than the final product. Children love the chance to mix colors and see what happens, they love to squeeze and spread glue, they love to add different materials. While they engage in these pursuits they are making discoveries about their world; paint drips down when we paint at an easel, glitter only stays where we put the glue, if we use too much paint, the paper gets wet and the brush tears a hole it. Children often talk as they create making it a wonderful way to facilitate emergent language and creative thinking. 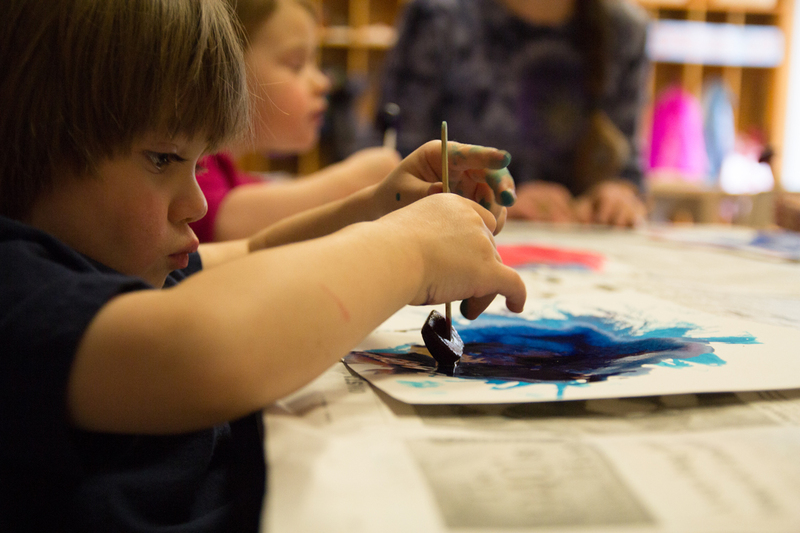 We recognize the importance of art as an every day experience for young children. That is why our classroom teachers incorporate it into our preschool day in a variety of ways. Bring on the messes, we’re busy learning!